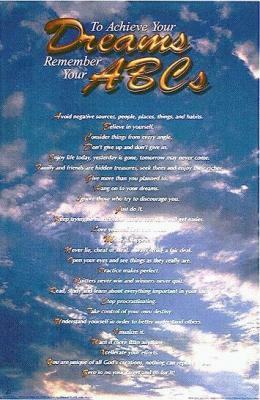 This "To Achieve Your Dreams Remember Your ABCs" Poster is the second design edition of the publication of these ABCs as a poster and features a blue sky back ground. The words are by Wanda Hope Carter. You won't have trouble finding a place to hang your beautiful and inspiring "To Achieve Your Dreams Remember Your ABCs" Blue Sky Poster as it will look great with any decor and is appropriate for any room in your home, dorm or office. According to the letters and contracts we have received over the years, the ABC posters in general have been used in homes, schools, offices of all types including doctors' and psychologists' offices, churches, waiting rooms, on TV and Movie sets, in locker rooms and in lecture halls. They have been seen by millions of people around the world helping to inspire and motivate those who are on track to achieve their dreams. They have inspired students, parents, children, teachers, pastors, artists, musicians, athletes, writers, business managers and owners along with many types of other folks who have goals to reach for and dreams to achieve. This poster will also make a fantastic gift that keeps on giving and it will be sure to change the lives of all who read it and take it to heart. Her "ABCs" have been published four times by major poster publishers since 1992. They have sold nearly five million copies including the Spanish version "Para Lograr Tus Suenos Recuerda El Alfabeto." An "ABCs" poster was used on the TV set of "Sister Sister," included in a "Wife Swap" episode and in a Disney "Lizzie Maguire" movie set. The words also appear on the book jacket of "The Living Dreamer" by Brett Angelson, and in "You Can Make Your Dreams Come True" by David T Perry. It has been published twice in Dear Abby, once as the original letter Wanda Hope Carter sent to her and once under a "Best of Dear Abby" column by the request of a reader. "To Achieve Your Dreams Remember Your ABCs" has been and still is featured on a wide variety of websites with the Author's permission and is the subject of many products on the market and those that are exclusively available throughout this website. Use the Buy button in the green box at the top right of this page. Get 100 Free Activity Points For Every Poster Purchased! Linda, you are just the BEST! - Please check your mail here. My kids love theirs. The one is hanging in Luke's room! Rocky thank you so much and you also go on my The Best!! List! I am so glad to hear that your kids love it! Wow that makes me so very happy to hear! I rarely get feedback but every time I do it is just amazing to me and I give thanks that God answered my prayers and even gave me the thought to write down the answers. Credit where due! That I get to find out from a sweet friend is even more meaningful! Thank you and for your support! Where would I be or this site be without friends like you and Linda? What a nice surprise to find this. Thanks so much! An old very good friend of mine used to say that to me all the time. Cool lol I'm fonda u 2!!!! Just ordered one for my granddaughter for her birthday. Thanks! Hi there wasn't one at paypal. I don't think it went through. Please check your mail. Thanks!